Yesterday, New York Lawyers for the Public Interest and its coalition partners Brooklyn Center for Independence of the Disabled, Center for Independence of the Disabled New York and MFY Legal Services, announced at a news conference that they are building a new broad-based group of riders and other advocates to push for Access-A-Ride fixes and reforms. The group is called AARRG! – the Access-A-Ride Reform Group – an acronym reflecting typical rider frustration. The coalition and Access-A-Ride riders spoke out about a pattern of abysmal service, punitive application procedures and unfair treatment by the Metropolitan Transportation Authority in a news conference outside MTA headquarters and at the MTA Board’s May meeting. Holding signs saying, “MTA: Stop the Access-A-Ride Horror Show!” and “Think the subways are bad? 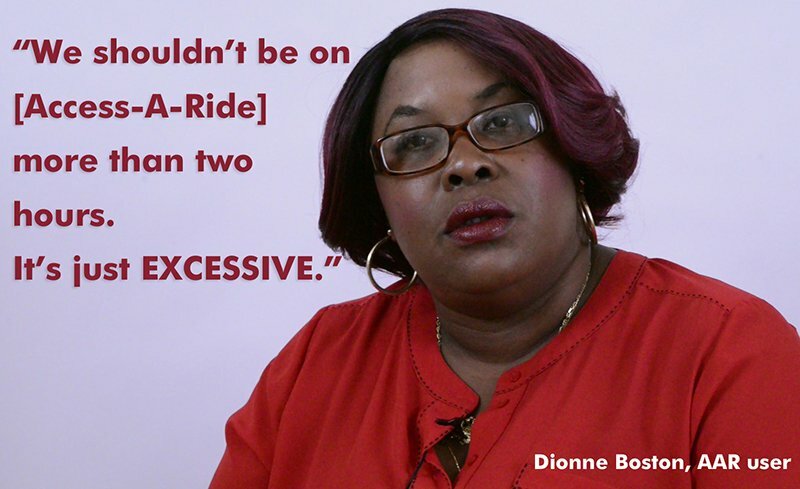 Try Access-A-Ride!,” riders told stories of hours-long rides, lost jobs and missed appointments, and called on the MTA, Governor Cuomo and Mayor de Blasio to improve and reform the service. Intended as the MTA’s mass transit service for people with a wide range of disabilities, Access-A-Ride provides about nearly nine million rides annually. It often is the only way persons with disabilities get to their jobs, the grocery, medical appointments or to see family and friends. “As an Access-A-Ride user myself, I know too well how unbelievably frustrating this service is. It’s long past time for a complete overhaul so it really works,” said Eman Rimawi, Access-A-Ride Campaign Coordinator and Organizer for New York Lawyers for the Public Interest (NYLPI), an organizing member of AARRG! Read the DNA Info coverage. Read the Bond Buyer coverage. Read the NY1 Noticias coverage. We Won! MTA Appears To Back Down On Planned Access-A-Ride Fare Hike The Metropolitan Transit Authority appears to have backed down on plans to raise fares on people with disabilities, after outrage from the Access A Ride Reform Group (AARRG! ).